New Hampshire may be a small state but it's tough, rugged and, above all, bewitchingly scenic. From jagged mountains to forest-fringed lakes, lush valleys to lovely beaches, this is a place that cries out to be explored and enjoyed in the big outdoors. Of course there’s also an urban scene, such as colonial Portsmouth, for a bit of sophistication. Our guide to the best places to stay in New Hampshire ensures you can find somewhere to stay to enjoy whatever activity takes your fancy. At the heart of the state is the Lakes Region where Lake Winnipesaukee, dotted with islands, is a popular place for canoeing and fishing. Or you can take it more leisurely with a cruise. Holderness straddles the Squami lakes at the base of the White Mountains and offers year round fun from sailing, fishing and hiking to skiing and cross-country skiing in winter months. In the north, explore White Mountain National Forest, great for hiking and berry-picking in summer, fabulous autumn colours in the fall, and skiing and snowshoeing in winter. Here you can climb Mt. Washington, the region’s highest peak. If you’re short on time (or energy) take the steam-powered, cog railway to its summit. Stalk moose in the Great North Woods or be amazed by the giant boulders in Pawtuckaway State Park, one of New Hampshire’s numerous state parks. For a bit of culture, head to pristine colonial settlements like Portsmouth or Canterbury Shaker village, a living-history museum just north of the capital, Concord, whilst a tour of Frank Lloyd Wright’s Zimmerman House is worth the trip. Prefer to take it easier? Head to Hampton Beach or go on the Ice Cream Trail around 47 dairy farms. Those with a sweet tooth should come in March; the best time to visit the sugarhouses where the famous maple syrup is made. And don’t forget to sample a fried-clam platter or a lobster roll. 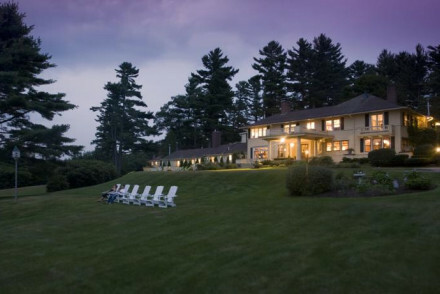 Choose what you’d like to do and then use our selection of the best places to stay in New Hampshire to plan your trip. Modelled after ocean liners the majestic,19th century Wentworth by the Sea is a classic grand coastal hotel with fabulous sea views, pool and spa. A country manor-house, set in 13 beatuiful acres with views of lake and the White Mountains, The Manor on Golden Pond offers stately bedrooms - some with fires or jacuzzis - a smart restaurant, tennis, croquet, cooking lessons as well as a spa. In the heart of the White Mountain National Forest, with hiking, fishing and skiing on tap, the charmingly rustic Notchland Inn offers superb five-course dinners to look forward to after a day’s exertions. Complimentary afternoon tea is offered at the Adair Country Inn, whose nine rooms are charmingly decorated in country-house style. Evening meals showcase the best of New England cuisine. In the small coastal town of Durham, Three Chimneys Inn offers elegant rooms, many with four-poster beds and fireplaces, and a more rustic restaurant serving honest, hearty cooking. 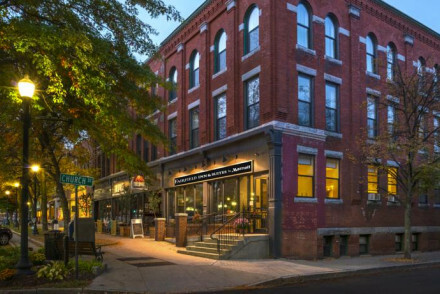 In the middle of lively Keene, Fairfield Inn & Suites is a historic building - a former department store - converted into a boutique hotel with contemporary style rooms, some with exposed brick walls. Although there’s a cocktail bar, there’s no restaurant but it’s walking distance to a wide choice of eateries. 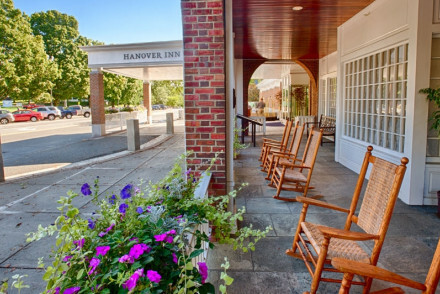 The historic Hanover Inn - a late 18th century inn - is at the heart of Dartmouth College campus and offers jaunty, spacious rooms with smart creamy colours and clubby, leather furnishings. There’s also a gym and a restaurant that focuses on local sourcing. 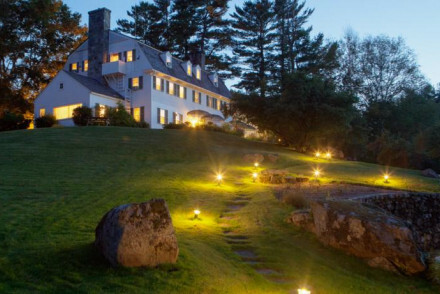 For more ideas, browse our list of the best places to stay in New Hampshire or contact one of our friendly gurus for advice. Enjoying beautiful surroundings in the small coastal town of Durham, Three Chimneys Inn is a gateway to New Hampshire's Seacoast region. Interiors are elegant and timeless, with four-posters, fireplaces, rich carpets, floral motifs and saturated autumn colours. The Sawyer Tavern serves local fare. Views - Located on a hill overlooking beautiful gardens, the Oyster River and Old Mill Falls. Historic redbrick hotel in central Keene. Interiors feature bold patterns, exposed brick in some rooms, queen or king beds. Delicious continental breakfast is served free of charge every morning. The hotel offers fitness facilities and cocktail hour in the bar. Close to restaurants and cafes. Great walks - Hike Monadnock Mountain, which inspired the likes of Ralph Waldo Emerson and Henry David Thoreau. 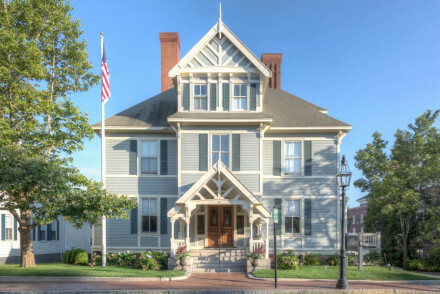 A beautiful Queen Ann building, masterfully restored, in the heart of Portsmouth. The sharp interiors are modern and indulgent while nodding to the building's rich history. An excellent breakfast is served each morning and helpful staff will guide you to the best dinner spots. Warm and welcoming. 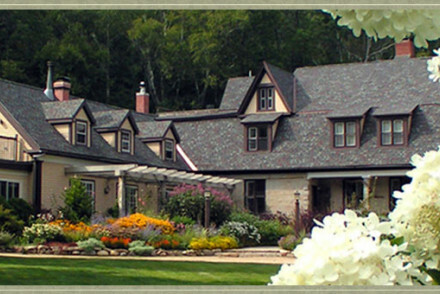 A beautiful romantic inn in the heart of the White Mountain National Forest. A cosy paradise for those active, nature-loving couples. The rooms are comfortable, welcoming and full of character. The superb 5 course meal served in the restaurant will be deserved after the day's outdoor activities! Quaint country inn set amongst hundreds of acres of ancient woodland. Interiors are traditional without seeming dated, and offer a glimpse into classic small-town New England charm. Huge variety of summer and winter activities on offer. Fresh, local ingredients are served up in the restaurant. Back to Nature - If your interests include skiing, hiking or cycling in one of America's areas of natural splendour, then you are well kept here. Hideaway - Perched atop a hillock in 200 acres of forest you can truly retreat into a private heaven! Local markets - Bethlehem has a Saturday farmers market in summer months. A fine New England country manor house set in idyllic grounds with sweeping views of the nearby lake and surrounding hills. Bedrooms feel stately; some have cosy fireplaces and private jacuzzi baths. The hotel has a sophisticated dining room as well as a more relaxed bar area. Quiet and secluded. 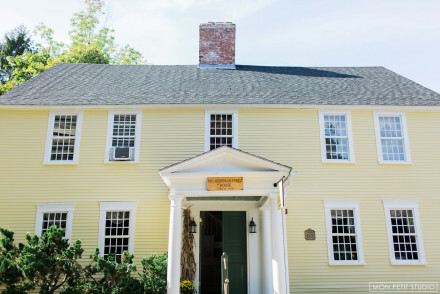 Located at the heart of Dartmouth College campus, Hanover Inn is an attractive neo-Georgian property with character and charm. Rooms feature dark hardwood furniture, and draw on Ivy League style with creams, plaids and leather. Restaurant serves farm-to-table fare sourced locally in New England. Sights nearby - Montshire Museum of Science is 1km away, while Hopkins Center for the Arts and the Hood Museum neighbour the hotel. Outstanding location - Situated at the center of the Dartmouth College Campus. A stalwart landmark of the New Hampshire coast, this gleaming white and splendid hotel has stood the test of time to become a paragon of hospitality. Interiors are classic and traditional with floral patterns, neutral colours and panoramic sea views. Restaurant, pool, spa, gym, golf, marina, bar. 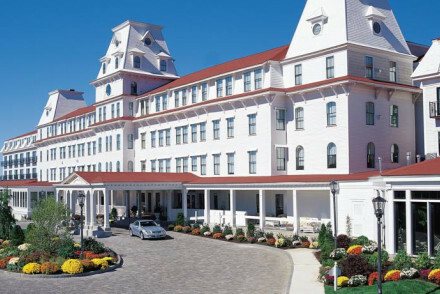 Landmark - Known as the "Grand Dame by the Sea", this hotel is a beloved jewel on the New Hampshire coast. Spa - The coast inspired the spa, a tranquil sanctuary dedicated to health and wellbeing. Sailing - Guests enjoy access to the privately-operated Wentworth by the Sea Marina. Traditional - A traditional eye for interiors creates a cosy space for relaxation.